Who loves ya, okra? This odd vegetable is looked upon with the same suspicion as grits by Northerners, universally hated by children at dinnertime and scorned by many gardeners as “not being worth the trouble.” It is a wonder that okra is even grown at all. Granted, a plate of slimy, boiled okra doesn’t exactly qualify as French cuisine, but there are better, tastier ways to prepare okra because it will always be a culinary treat breaded and fried, and it is a must ingredient for vegetable soups, particularly gumbos. No matter how you cook it, however, okra has a nutritious punch that includes vitamins A, B and C as well as important minerals such as calcium, magnesium, zinc and potassium. May is the month for planting okra in the Triangle. And if you don’t get around to it, the first few weeks of June will do just fine, too. Whenever you decide to plant though, it is a good idea to soak the hard, BB-sized seeds overnight before planting. A well-draining site that receives plenty of sun will really get this heat-seeker off to a fast start. Also, applying a fertilizer that is low in nitrogen but high in phosphorus will provide the ideal additives to give a real kick-start to young plants. High-nitrogen nutrients will encourage lush leaf growth, but it will be at the expense of pod production. As far as varieties go, the tried-and-true selection for years has been ‘Clemson Spineless,’ a stalwart standard that will grow to 5-feet tall and produce edible pods through the summer. ‘Cajun Delight’ is a tasty introduction with superior production capabilities that earned it a 1997 All-America Selection award. 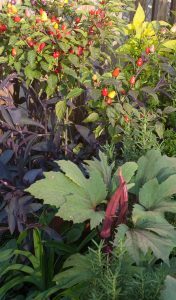 ‘North and South Hybrid’ won’t cause the Civil War to be re-fought, but it is a variety that should be of interest to gardeners looking to extend the growing season into the fall, since it is more tolerant of cool weather than other selections. If garden space is a problem, there are dwarf varieties. ‘Lee’ produces plenty of pods on 3-foot plants. ‘Baby Bubba’ is another shorty, but it bears full-sized pods at twice the rate of ‘Clemson Spineless’. On the other hand, if you want to make a bodacious statement with okra, plant ‘Star of David’ and stand back because it can grow into an 8 to 10-foot goliath that refuses to be ignored in the garden. One thing that gardeners who are always looking for a little extra pizzazz in the landscape should realize is that okra is a close relative of the highly ornamental hibiscus. Just the sight of its beautiful blooms should be a clue to the decorative possibilities of this vegetable. Okra is not a favorite deer-veggie, but they will eat it if that is all there is. 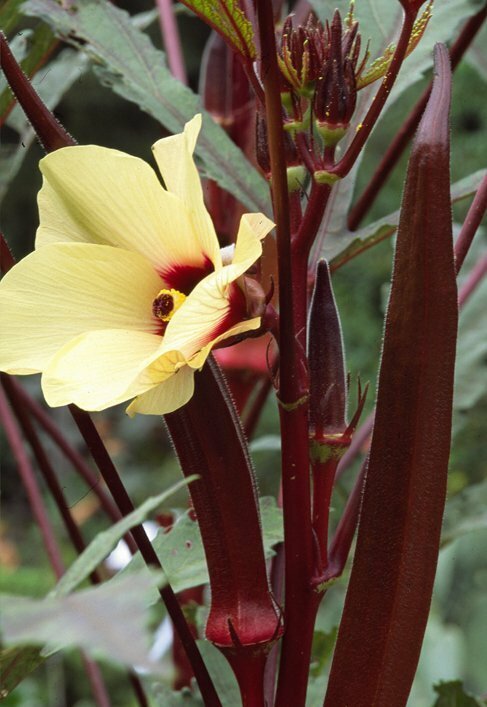 Some okras have other ornamental attributes. The tropical-looking foliage of ‘Lee’ and ‘Baby Bubba’ makes them good candidates for being mixed into potted plantings or flower borders. And if you want to see more red in your landscape, try adding some of the crimson-hued varieties. ‘Burgundy’ has deep red stems and leaves streaked with similar coloration, matching the dark red of the tender pods. Other cultivars with equal eye-candy sassiness include ‘Red Velvet’ and ‘Red Spray’. Even as the summer season draws to a close, okra pods can be interesting additions to dried arrangements. Just allow the unpicked pods to dry on their stalks and then add them to indoor creations. For more glitz, spray-paint the pods. Gold and metallic-flecked colors especially make them stand out.